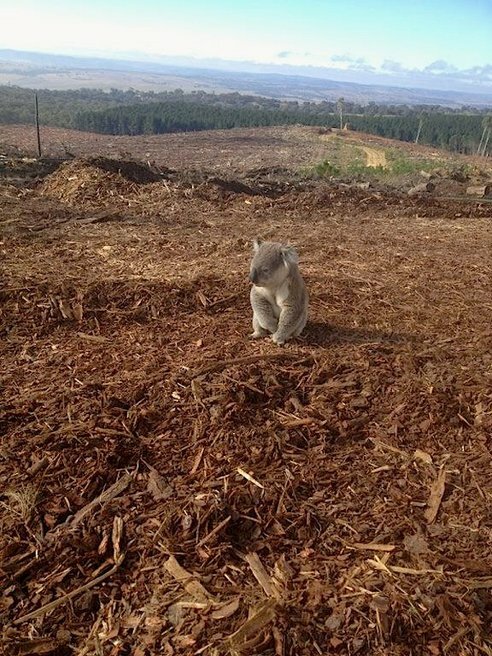 Here’s a sad picture I found today (at Treehugger.com), a young male koala sitting atop the remnants of a forest. As someone helpfully commented on the article, the koala had been relocated (along with the rest of the koala population of the area) to a new home prior to the begin of an approved logging operation, but was apparently trying to find its way from its new home to its old home via a broader ‘home range’. The logged area, a commercial pine forest, had formed a link between two preserved native forest areas. This koala, along with a few others that were found, were relocated again. Commercial forests serve as crucial habitat links, but to be effective, they can’t be clearcut. I imagine that by the time this particular pine forest regrows, the ingrained link between the two habitat homes may have faded in koala memory. Another corridor area that had a different fate was the Northeast Ecological Corridor in Puerto Rico, a newly-established link between several protected areas. The Corridor will mainly protect the area from development in the form of megaresorts, which would cut off various preserved areas from one another. Established as the result of a grassroots effort, there are numerous species of flora and fauna which will hopefully profit, but probably the most mediagenic is the critically endangered leatherback sea turtle (Dermochelys coriacea), which uses the area as a breeding ground. This corridor is a contentious subject due to the commercial interests in land development, so it will bear watching over the years to see just how successful and/or protected this designated area remains.